DES MOINES, IA -- The owners of Vincent, a rescued 60-pound English bulldog, aren't quite sure how old he is. 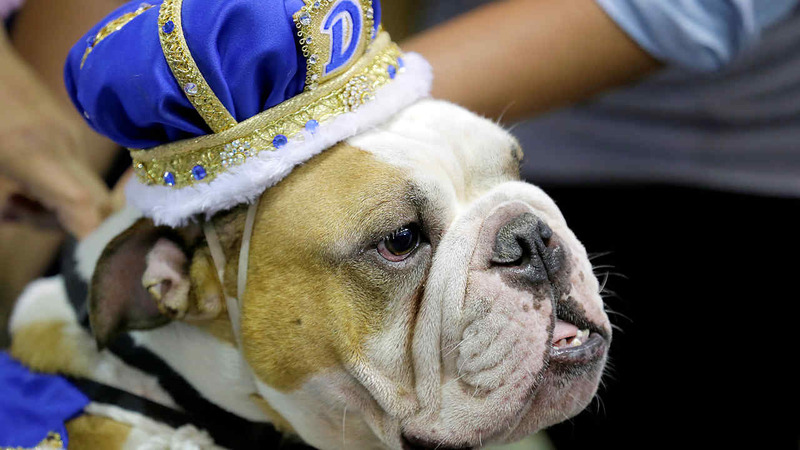 All they know is that their young pup is now a pageant king, having won the 37th annual Beautiful Bulldog contest at Drake University on Sunday. The tongue-in-cheek contest is the opening event of the Drake Relays, a prestigious track and field meet to be held next week at Drake Stadium. Vincent, a brown-and-white pup who lives just up the road from the stadium, will serve as the meet's mascot. The runners-up were Meatball, whose biggest fears are garbage bags and limes, and a 1-year-old pup named Daffodil. Meatball and Daffodil will serve as alternates for the Drake Relays if for some reason Vincent can't fulfill his duties - which will mostly entail photo shoots and an introduction during Saturday's opening ceremony. Vincent was a first-time contestant after his owners adopted him from the Illinois English Bulldog Rescue organization in February. "It popped up and we were like, 'Let's give it a try!" Vincent's owner, Meredith Green of Des Moines, said. His owners, who think Vincent is about 3 years old, said he likes car rides and running up the stairs. They'll find out next weekend if he's also a fan of track and field. Vincent succeeds Tank, whose sturdy frame, gentle personality and camouflage outfit won over the judges in 2015. The slate of competitors was down five from previous years after a few scratches and the recent death of Linus the Lovebug, last year's winner in the "Best Dressed" category. Deliylah, who competed in 2013 and 2014, gave birth to four puppies on the day of last year's pageant contest - and she and three of her puppies took part Sunday. She won the "Drake Spirit" award for making it back to the stage after a one-year absence. Theodore was the social media king, with more than 6,000 followers on Instagram.